I mentioned in my last post that I would talk a bit more about off-camera flash next. When you take flash photography with an on-camera flash it will create a very flat illumination of your subject, as the light source comes from the same angle as you are photographing. By placing the light source to the side you can get much more interesting light. The shadows help you perceive depth in your photo. Two years ago I bought a third party radio trigger for this purpose. You put one part on the camera, and the other part on the flash and it allows you to trigger the flash from anywhere in the room. It has worked okay, however, during a Zumba dance shoot a few weeks back it completely failed me. This post will give you a backup option in case that would happen to you. It requires a line of sight, but it is better than nothing. 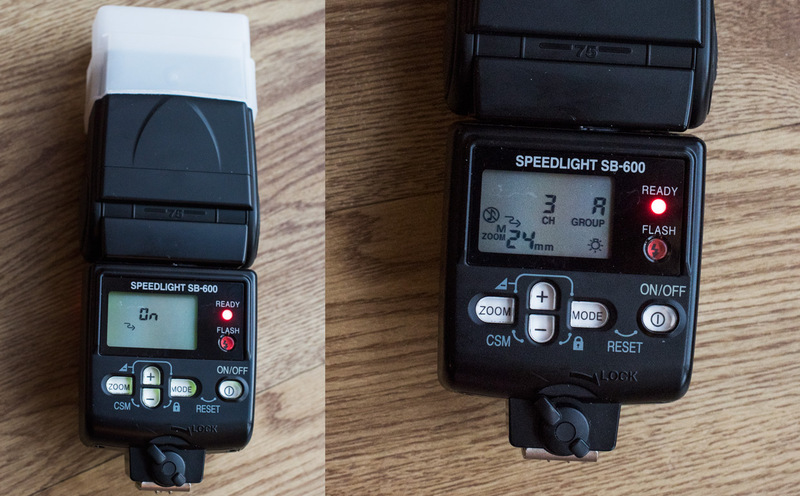 For the SB-600 flash you hold down the zoom and minus button. Note the CSM marking on your flash that indicates which keys to press. After a few seconds it opens up a setup menu, where you can switch between the options, red light, sound, LED illumination and slave mode, by using plus and minus, and toggle it on and off with zoom and mode. The slave mode is indicated by the wiggly arrow. When activated it should look like the left photo below. By pressing the ON/OFF button you can then switch to a panel that lets you select the channel to communicate on and flash group. Left image shows slave mode turned on. Right image shows that I am using channel 3, and that the flash belongs to flash group A. I have also turned off the sound and turned on the LED illumination. For the SB-700 flash switch the On/Off power to Remote (you need to push down the button as you turn it). That should give you the menu shown in the photo below. 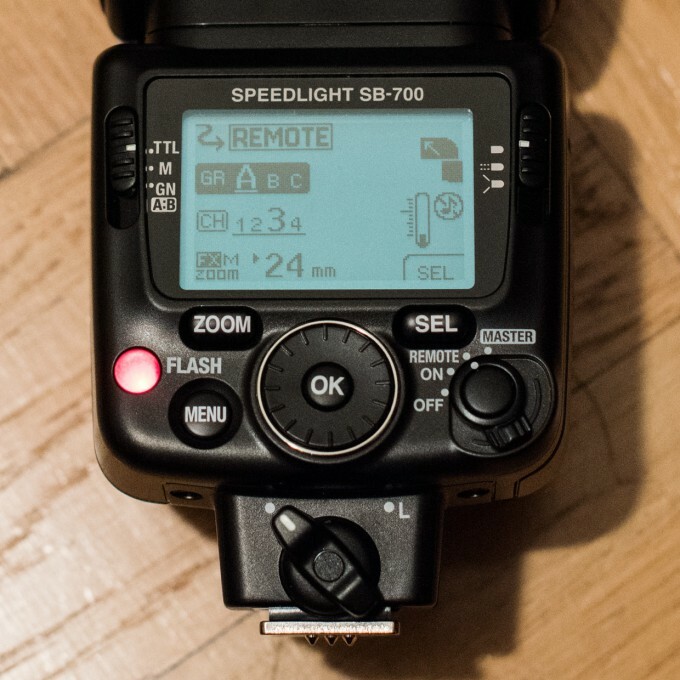 The user interface on the SB-700 flash is more intuitive. Turn the ON/OFF dial to REMOTE, then use SEL to toggle between group and channel. The rotating dial lets you then select between the groups and channels. Here I am using Group A and channel 3. On your camera you need to go to option e3 Flash cntrl for built-in flash in the menu (left image below). There you can select Commander mode (middle image below). In commander mode you can control your external flashes. Here I am using TTL mode which means the flashes fire a brief pre-flash to decide how much flash power to use. I want the external flash to provide most of the light, so I have dialled down the internal flash to -2 (right image below). In the camera menu I have set the flashes to TTL mode, and the channel to 3 (same as on the flash). Using TTL means that the flash exposure will be automatically adjusted by a brief pre-flash that measures the amount of light returned to the camera. However, you still have to make sure that there is enough ambient light to provide some context. Otherwise you will get photos with lots of happy people surrounded by complete darkness. You can also switch it to manual mode, where you decide the flash power directly. The banner photo at the top of the page is from a recent post-doc formal where I used the method described here to get my flash to operate off-camera. There was quite a bit of lag between pressing the shutter and the flash firing. I think it was mainly due to the red eye reduction, as the TTL should be quite quick. Another thing that I noticed was when the batteries were running low my external flash would fire for the TTL pre-flash, but not for the second real flash. At that point it would have been better to switch to manual mode instead to make use of the first good flash instead of wasting it on the TTL measure. If the optic trigger is unreliable for you then another option is to have a flash mounted on the camera but then turn the flash gun to the side, upwards or even backwards. By bouncing the light off either the walls or the ceiling you can get it to hit your subject from a different direction. Another bonus is that the bounced light becomes quite soft (without harsh shadows) since the reflective surface is quite big. This will not work in large spaces, but it can come in handy if the optic triggering of the external flash does not work for one reason or another. Good luck flashing your friends from unexpected angles!